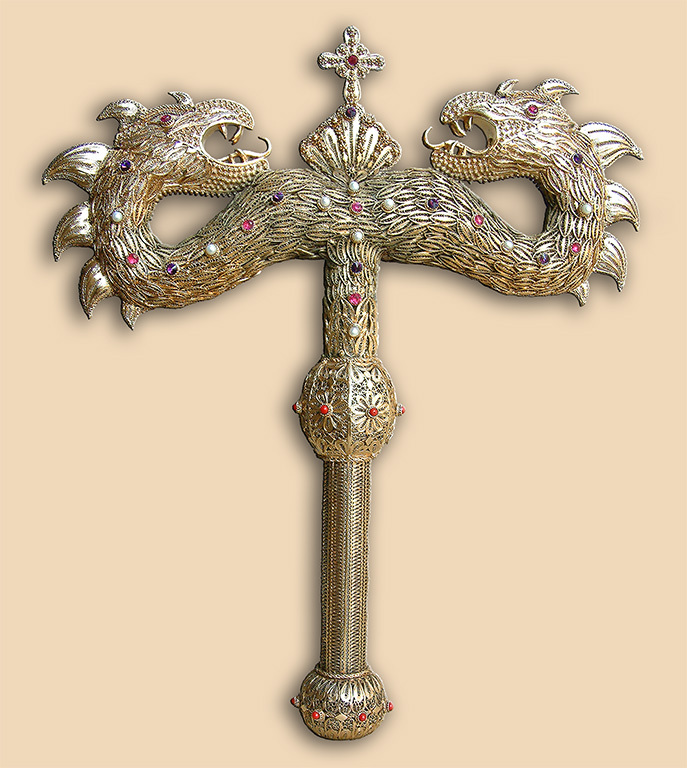 Silver filigree crosier, guilded with 24 K gold, 168 cm high and with 5 detachable parts. Top part has a mounted silver filigree dragons, decorated with 18 corundum rubies, 8 synthetic iolite and 8 synthetic amethyst stones, and 18 fresh water pearls. Body, in silver filigree, ends with apple decorated with 7 natural corals. Second part also has a filigree apple with 7 natural red corals. Third, fourth and fifth (bottom) parts are decorated with 42 rock crystals, and 3 additional apples are decorated with 3 natural red corals and 3 rock crystals each. Teeth, fins of dragons and apples are left in silver color and all other parts are gilded with 24 K gold. Bottom end of the staff has a rustproof steel tip. Custom made leather carrying case with silk interior has an embossed logo of the Metropolitan. red corals, rock crystal, leather, silk. Technique: filigree, granulation, stone setting, gilding. Size: staff 168 cm, dragons 30 cm. Weight: crosier and staff 2213 grams. Commissioned by: H.G. Poriphirios, Bishop of Martiropolis.